Will I die if I swim at the Jersey Shore after getting a new tattoo? 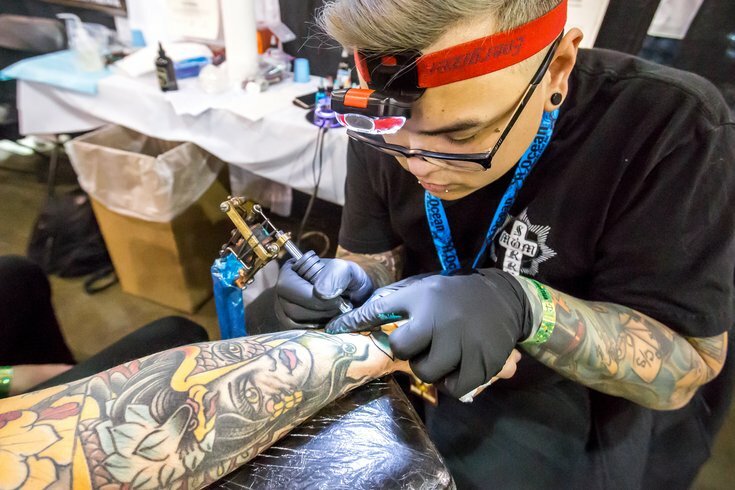 Phil Hatchet-Yau of San Diego gives a tattoo during February's Tattoo Arts Convention. Well, not me. Nope. Not by a longshot. There is a graver threat than environmental apocalypse or becoming Mary Lee’s brunch. This isn’t about me being an internet tough guy. Quite the contrary. You see, I got my first tattoo in December. It was to fulfill a promise I made to myself should the team that would never win the World Series win the World Series. I’ve since gotten two more. You could say I have an addictive personality (as my bride pointed out when I mentioned I might get a fourth soon). That ink, however, has me worried about going into the ocean when it reaches an acceptable temperature, which will seemingly happen earlier this summer for let’s-just-pretend-they’re-inexplicable reasons. That fear comes courtesy of a NY Post story this morning. It’s based off a Fox News story which is based off a Metro story based off a case referenced in the British Medical Journal. “We present a case of Vibrio vulnificus septic shock and cellulitis in a patient with chronic liver disease that occurred after obtaining a leg tattoo with subsequent seawater exposure in the Gulf of Mexico,” read the BMJ summary, which was initially published on Saturday. That's a whole lot of medical mumbo jumbo. Let's whittle it down to real-people language. A 31-year-old guy got a praying-hands/crucifix tattoo and then went swimming in the Gulf of Mexico. The tattoo got infected, and the man got fevers, chills, a rash and, ultimately, a leg-turned-purple and kidney failure courtesy of sepsis. They say you aren't supposed to go in the water within two or three weeks of getting fresh ink. This is good advice, what with the risk of infection being an issue beyond this rare case of death by post-tattoo swimming. So, yeah, being 13 days removed from my last one, and abiding by the care guidelines provided to me by my tattoo artist of choice, I think I'll steer clear of the water this weekend. If you're in the same position, you should probably do the same. If you have any suggestions for my fourth tattoo, please send them my way. Just know that I'll probably wait until September to get one. I don't want to just sit on the beach all summer. The water's so warm and enticing.